Dr. Venki Ramakrishnan. Photo by Max Alexander at emax@maxalexander.com. 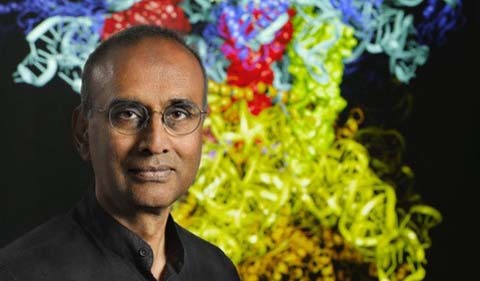 A colloquium features Nobel Prize laureate and Ohio University alumnus Dr. Venki Ramakrishnan discussing “Termination of Translation in Bacteria and Eukaryotes” on Thursday, May 2, at 11 a.m. in the Baker Center Theater. His book Gene Machine: The Race to Decipher the Secrets of the Ribosome will be available for sale and signing. Refreshments will be served following the talk. Ramakrishnan won the 2009 Nobel Prize in Chemistry for his work on the structure and function of the ribosome, jointly with Thomas A. Steitz and Ada E. Yonath. He also received the Louis-Jeantet Prize for Medicine. He was knighted in Great Britain in 2012 and in 2015 was elected President of the Royal Society for a five-year term. He is a member of the U.S. National Academy of Sciences, Leopoldina and EMBO, and a foreign member of the Indian National Science Academy. Ramakrishnan earned a Ph.D. in Physics from the College of Arts & Sciences at Ohio University. Abstract: In all domains of life, the termination of protein synthesis during translation of the genetic code is triggered by the entry of a stop codon in the A site of the ribosome. These three stop codons are recognized by a protein release factor. However, release factors in bacteria and eukaryotes appear to have no structural or sequence similarity. In this talk, I will describe structural work that sheds light on the basis of release factor function in the two domains of life and show that despite their dissimilarity, they share certain common features and mechanisms.